Nashville’s the Exit/In, a classic yet almost easy to miss venue, recently played host to Los Angeles band Nico Vega, an up-and-coming powerhouse of a band known for their mix of musical elegance and gritty energy. The opening band, Oh No Fiasco, with whom Nico Vega share a label, combine alternative rock roots with a sometimes cutesy punk flair. Oh No Fiasco opens, immediately setting the bar for showmanship. The band’s lead singer, Lindsey Stamey, is a complete fireball on stage, melting faces right off the crowd as the band plows full force through the first song of their set. The stage is completely electric as the five members of the band bounce, dance, and enjoy what they obviously love to do. Theatrics are integral to the band’s performance, exemplified in moments where the band’s drummer spits water onto the drums while playing, showering himself and the stage, or when the keyboardist places a small keyboard on another member’s feet and plays through the remainder of the song. 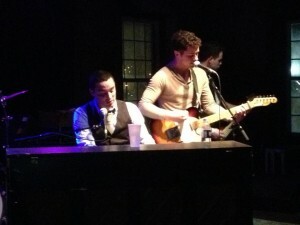 Oh No Fiasco ends their unfortunately short set with Stamey singing from the balcony seating of the venue. The group is an obvious crowd-pleaser as fans on the floor show their affection and admiration as she swaggers on through. 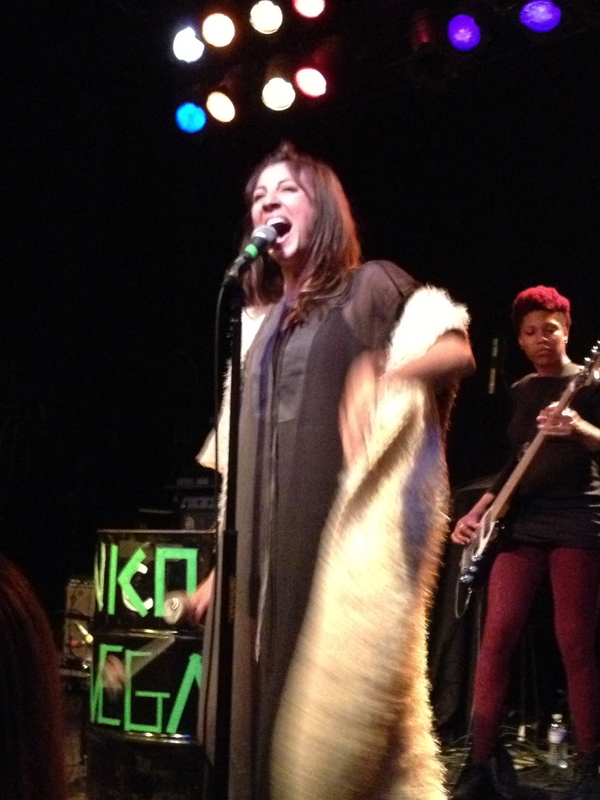 Following Oh No Fiasco, Nico Vega takes the stage. Lead singer Aja Volkman approaches the mic, looping vocals in harmony as the band forms onstage. The performance is very personal, humble even. 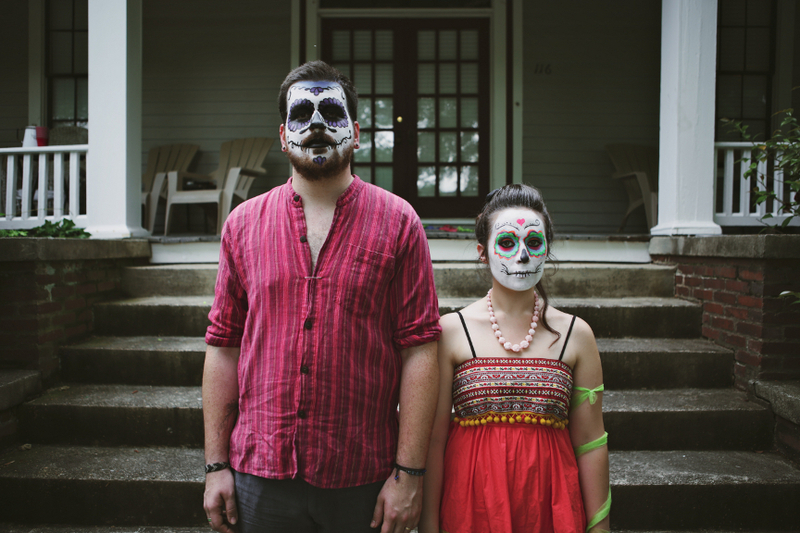 For a band that’s known for exemplifying a rebel spirit, they’re all terribly mild-mannered. Not to say they can’t kick out a jam like no other. Volkman’s vocals are high-flying, soulful, and smooth as silk one minute, then growling and full of all the raw passion you’d expect from someone who stands on a steel barrel and sings while beating the sides like a drum. Her showmanship onstage is energetic, swaying and dancing from side to side, hands raised or slapping cymbals of the band’s drum set. Her passion and feeling for the music itself is soul-touching on a real level. Not surprising coming from a band that considers itself more a way of life than just an expression of musical talent. 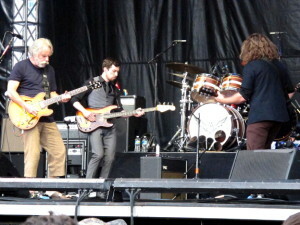 The set features songs from the band’s self-titled album of 2009 and their recently released EP, Fury Oh Fury. The band opens with “Lead To Light,” leading into “Fury Oh Fury” and “Lightning,” all songs from their current EP. In the midst of the fury and passion comes the song “Wooden Dolls,” a slow, expressive tune about the unity of people and also the barriers we create, all sung from atop the aforementioned steel barrel onstage. Volkman’s sincerity is clearly visible in her presentation of the lyrics. It’s pleading, hopeful, and beautiful in every way. One of the band’s more easily recognizable songs, “Gravity” begins slow with floating guitar and ethereal vocalization, but suddenly exploding into life as the song picks up pace, delivering hammering drum beats alongside Volkman’s vocal power as she sings about the oppression of conformity. The set closes with the band’s powerhouse anthem: “Beast.” Featured in the trailer for the video game Bioshock Infinite and also a trailer for film Pacific Rim, this song alone is at least partly responsible for the band’s recent success, and it’s very clear why. The song begins with a pounding, militant drum and heavily distorted guitar. The guys and girls of Nico Vega know what this song means for listeners, fan or otherwise, and they deliver on every level. It’s everything the band is about, rejection of oppression and a demand for unity amongst all people against the “beast of America.” That passion is palpable, almost a lusting passion for defiance against whatever it is that holds us down and forces its will on us. My music fandom began sitting on the carpeted floor of a middle-class house in the suburbs of Cleveland, Ohio. My parents owned a record player and a handful of albums, among them The Beatles’ Revolver and The Freewheelin’ Bob Dylan. Much like the scene in Almost Famous when the protagonist’s sister turned her younger brother onto her tunes, the needle touched vinyl, and pretty much everything changed. By junior high, the music of The Beatles and Dylan saturated my psyche and shaped my identity. At the time, the likes of Simon & Garfunkel, The Rolling Stones, and Led Zeppelin also seared my ears and soothed my soul. Rock ‘n’ roll inspired all-night adolescent airband artistry and class presentations on the poetics of the Don McLean song “American Pie.” Tragedies like the respective deaths of John Bonham and John Lennon jolted our reality. We discovered that Bonham died when we went to school one day and had to ask, “Why are all the burnouts crying?” But of course when Lennon died, everybody cried. Like the McLean song prophesied, we had many, many days when the music died. In my high school years, punk, new wave, and of course the jubilant jangles of REM and the angelic anthems of U2 put some distance between me and 60s-70s classic rock, but I grew up in close enough proximity to the actual hippies and stoners that I would always suffer an epic kinship to these transformative periods of American popular music that still impact us today. With all the burning-out and fading-away and ultimate fatality, it’s no short miracle than any of the greats that all but danced down the apocalypse still survive this far into the 21st century, to this post-2012 period of popular musical renaissance and revival. With all this in mind, I feel such gargantuan eardrum-obliterating gratitude in relishing the immediate memories of the fantastic fact that in June 2013, in a span that stretched 16 days between two amazing weekends in Tennessee, I would see Paul McCartney at Bonnaroo and Bob Dylan on the Nashville riverfront. I’m likewise blown-away by some of the other bands we’ve been able to hear, the peers for my ears, who along with the headliners create bookends of beauty and blessing, of soggy singalong eyes and goosebump-inducing bliss. Frankly, I cannot hype enough hyperbole to express the hopeful holiness, mix enough metaphors to convey the meaning, or raise high too many mocktails to celebrate the recently passed occasions. Frankly, I would feel too selfish to savor this if I didn’t have the chance to suggest you catch Dylan or McCartney who are both still on tour, if the other peers-for-the-ears were not still hitting up festival-after-festival for the rest of the summer. As endless rains fall on my 4th of July holiday weekend, I scribble this testimony in hopes that someone might get a nibble of the goodness I’ve already experienced and perhaps seek out some of these shows the rest of the summer. As I ponder some of the more painful and plainly ludicrous prices that others have paid for the privileges I enjoy, I admit that I am most patriotic when it comes to our popular common culture, from sport to movies, but I am a patriot when it comes to music most particularly. Since The Beatles official touring ended in 1966 and since Lennon died in 1980, I don’t think I’ve ever really wrapped my mind around the sheer significance of a Paul McCartney tour. Sure, we hear snippets of his later work and lots from the Wings period, but at root, we’re not hearing McCartney cover The Beatles; McCartney is a Beatle. Here in my mid-40s, more than a decade into the new century, I am watching a man in his 70s, looking and sounding sharp and charismatic do nothing shy of reclaiming and reviving with sonic groove and grace the greatness of The Beatles. We hear love songs that kindle every feeling of passion I have for my partner dancing beside me and our world living and dying around us. We hear a song of letting-go like “Let It Be,” and for those few minutes we actually obey and let go; we let, it, be! Psychedelic moments surge forth from the tunnel of memory into the sober mess of the present, and we get crazy happy hearing “Helter Skelter” or “Being for the Benefit of Mr. Kite!” Throughout McCartney’s set at Bonnaroo, I had several delightful moments where disorientation met déjà vu, and I felt myself wonder, “Is this even happening?” Similar sensibilities of timely and timeless wonder would return in a little over two weeks at the Nashville riverfront. Most people benefit from an extracurricular passion or hobby or two—or in my case several. As much as I have hoped to enhance and enjoy the avocation of music fandom, at times, I almost abandoned it or even worse sabotaged it. At one point, I almost lost track of the best tracks from sheer necessity and lack of time or lack of money. But then it gets worse, at the very time my fandom had rekindled with verve and passion. Like too many before me and too many after me, I tried to spice up the musical listening and dancing experience with drugs and alcohol. This resulted in bad trips, drunken mistakes, and general stupidity—all in pursuit of a quicker fix and higher high. The Americanarama festival that’s now on tour brings together artists for whom, all at different times, I have an acute recollection of almost wrecking the cosmic connection that their music brings for me. Spanning the years from 1988 to 2008, from the days of youthful entheogenic experimentation to the seemingly endless nights of excessive intoxication, I occasionally overestimated my abilities and my tolerance and seriously compromised my boundaries and my values. Let’s just say I’d undermined otherwise potentially perfect nights with The Grateful Dead, My Morning Jacket, and Bob Dylan, ruined not so much for anyone else, but trashed for myself. Yet on the last day of June, I had an opportunity for musical redemption, getting high on the songs and on life, on enjoying the modesty and the clarity of not being “that guy” at the show. Former Dead and current Furthur guitarist Bob Weir performing solo begins the itinerary, and we got to the show early enough to catch his set. In fact, we could hear Weir’s soundcheck as we lined-up outside the venue and were satisfied to get a spot up-close by the stage—even if the ground, instead of a carpet of grass, was merely a fresh layer of mulch, the kind that smells just a little too fragrant, too much like, well, mulch. Other reports have it that the sound quality suffered towards the middle and back of the field, but we were glad to be so close and not need earplugs to enjoy the show. After opening with a Ratdog track that I enjoyed but didn’t recognize on electric guitar, Weir followed on the acoustic with the Dead standards “Loose Lucy” and “Friend of the Devil.” The pearls of rock wisdom that lit up his lips and fell from Weir’s lyrics were simple yet prophetic and paradoxical in the opening song: “If we don’t believe together, we might just cease to be”; and the final refrain “Dreams are lies, it’s the dreaming that’s real.” Of course this rings authentic to me, for whom the drunken dream was a lie, but dreaming a sober psychedelic experience suddenly became real! My rekindled Dead interest has increased over the last few years as I have rediscovered their music without the aid of any of my former chemical crutches. Music that I once presumed required a listener to be intoxicated has opened itself up to me in new and magical ways completely clean. Last summer, I missed a Furthur show that I’d planned for—in order to attend a funeral; I still have hopes to catch one before too long. I cannot help but admitting that learning Bob Weir would be part of this AmericanaramA event felt like some beatific cosmic payback for doing the right thing last year. After covering the Bob Dylan track “Most of the Time,” mentioning that we wouldn’t hear it later, Weir closed his too short set with a track he co-wrote called “Cassidy.” The lines invoke endless youth: “Ah, child of countless trees. Ah, child of boundless seas.” The stories behind the song are both a charge of hope for a young child born to the Dead tribe back-in-the-day and a tribute to the late Neal Cassady, the reckless and impetuous idol of Ginsberg, Kerouac, and the Beat Generation. The old me was like Neal Cassady, one who sought a false boundlessness of hedonistic debauchery, but the new me might be more like a reborn child who sees countless blessings in a sea of hopeful faith and fidelity, an inner freedom to which the many wildly-winding and rocky-rocking roads finally led me. I must say that the time between sets at shows can grind down my serenity and patience. Whether out at the food lines and bathroom lines or standing or sitting simply waiting, the minutes that usually fly by just drag on. This time we brought a deck of cards to pass the time as we sat on our now mulch-soiled blanket. 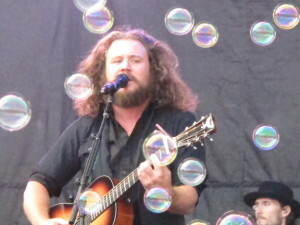 But we could barely finish one hand of rummy before My Morning Jacket stormed the stage to open with a campfire anthem that more often closes a show, “Wonderful (The Way I Feel).” The ensuing 75 minutes flew by, with many of our absolute favorite Jacket songs and some surprise back-catalog nuggets. The whole band was tight, animated, on. Something about seeing them in daylight from so close to the stage, especially before the people around us were totally trashed and pushing past us, made this a perfect set for me. It’s a great comfort to me that another Dead song called “Wharf Rat” is about a down-and-out drunk and that this tag has become the moniker for the Wharf Rats, the seminal clean-and-sober fan community that’s created a far-flung fellowship and meeting support structure for Deadheads who voluntarily abstain from alcohol or drugs. All this said, the Grateful Jacket ranks as one of my greatest concert experiences ever, just those two songs, almost like it was destined to happen since before our MMJ boys were even born. During some of the jammier moments, the way the rest of the Jacket members focused their attentions and intuitions on Weir was just mindblowing. The almost acapella harmonies at the end of “I Know You Rider” with Bob, Carl, and Jim singing to the center of my gut, that was so phenomenal that I just want to cry thinking I actually got to see it! Ever since I first heard it some 25 years ago, the line towards the end of the song—“I wish I was a headlight on a northbound train”—has conveyed such hope for me; others have been that light for me, and we can be that light for others. 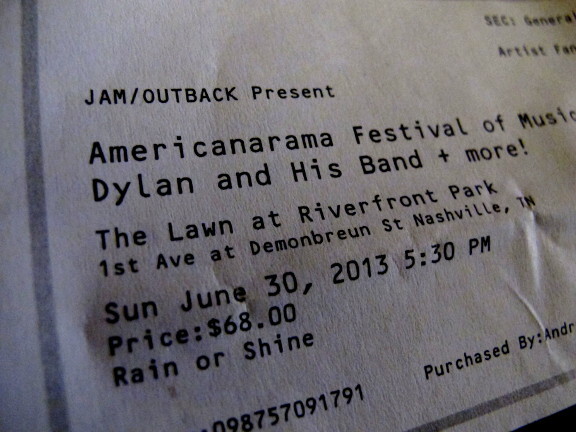 At this point, AmericanaramA could be called AmericanaJamma if you ask me. Smiling, I went from “wow” to just more—wow wow wow! 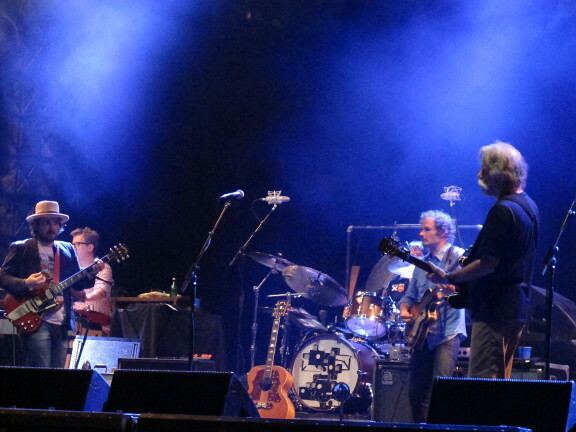 The collaborative synchronicity and spontaneity continued during the Wilco set when Weir returned for two more songs, first the Dead’s “Bird Song” followed by a face-melting and sheer shredding rendition of “Tomorrow Never Knows” by the Beatles. For all their musical and lyrical inspections, to all the setlist-shapeshifting with each night a different confection, My Morning Jacket and Wilco are wonderful heirs to what the likes of Dylan and the Dead have done for American music. This life has been a journey between polarities, from the desperation found in “Friend of the Devil” to the grace of Jeff Tweedy opening with “Blood of the Lamb,” Woody Guthrie lyrics set to Wilco music. My past experiences of Wilco live had been daytime sets at Bonnaroo where they were a bit woozy for me, even sleepy, but not that night, that last Sunday in June. 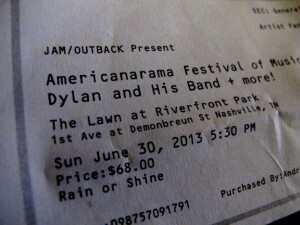 Neither Wilco nor My Morning Jacket needs to take the opening spot on a tour, but AmericanaramA conceives itself more as a concept roadshow, of which Dylan has participated in many, like the fabled Rolling Thunder Revue. The crowd at Nashville spanned the generations. 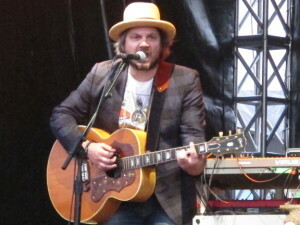 Rather than a crew dominated only by old Deadheads and Dylanologists, the field was filled with lots of younger folks, including those who seemed to know most every Wilco or Jacket song. By the time Dylan took the stage, we were already full to overflowing from the first four hours of the night. To see Dylan in his proper context is to approach him as everything we’ve heard and read and nothing at the same time. Dylan destroyed expectations when he went electric, when he went for Jesus, when he refused to be a spokesman for whatever generation and instead let his song-poems speak for themselves. 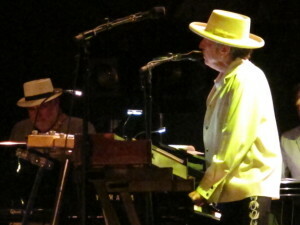 Dressed in a big white hat and impressive white jacket, growling and spitting his verses, Dylan was just another white MC dressed-in white and laying his vision of the world down on the greasy backing track of the white man’s blues. Newer tracks like “Early Roman Kings” could either invigorate or indict the image of power that Dylan undermines even as he takes advantage of it. Looking around the audience, we are all benefactors of that vision, where we’re both critic and cynic and innocent psalmist all at the same darn time. Seeing his swagger sinks deep, because by recalling the badass he once was he also reminds us that this elegant grizzly elder is more badass than many of his contemporaries could ever be. The opening track of the main set is “Things Have Changed,” as if to rub-in and reiterate that this isn’t our freewheelin’ folk singer that I first discovered on vinyl. He closed that set with “All Along The Watchtower,” and we danced near the back of the field, having moved just two songs ago from our spot up close, savoring the view and lights. The lyrics of “Watchtower” walk to the center of me, for this speaks a story from which I am now at a fragile but triumphant distance. There was a time when I could “get no relief” not even from drinking wine, when everything seemed false, when I felt trapped by fate, when the hour most definitely was getting late! I can’t undo leaving early or deny that Dylan will probably always remain just beyond our grasp of who we think Dylan is. Americanarama is still on tour as of this writing, and I imagine that something freewheeling and rolling and thunderous in the spirit of American music awaits every fan with tickets to catch this show, sober or not, with a surprise encore like Nashville or with the “Ballad of a Thin Man” that most crowds get. It’s past time to plan and almost time to roll from the annual axis of anxiety and anticipation, past preparation and into celebration. It’s the sensational and sweaty secular summer holiday of the midsouth. It’s the perennial June jubilee known as the Bonnaroo Music and Arts Festival in Manchester, Tennessee. 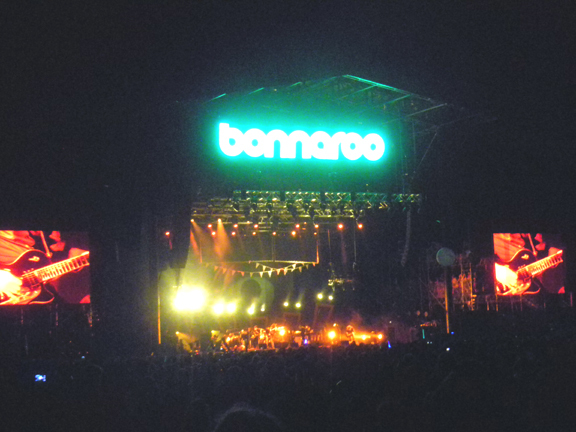 Featuring a tantalizing top bill of Tom Petty, Mumford & Sons, and Paul McCartney, Bonnaroo doesn’t stop with big gigs, as those with the most name-recognition are matched by the mass diversity of talent down the poster from there. Each spring, curious and determined fans can study the schedule and its array of stages to discover nuggets they didn’t expect and new acts that could change their listening experiences for the better and forever. 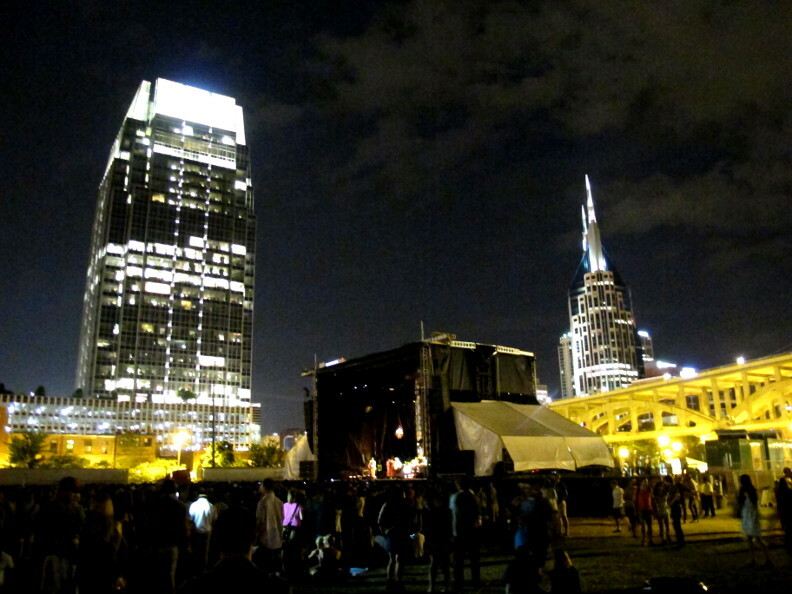 Nashville continues to remake its music reputation for the better. Nashville’s talent pool remains enormous, and we witnessed this again as local four-piece rock/pop outfit Dinner and a Suit recently performed at the Cannery Ballroom in Nashville. The simple-looking band launched immediately into a high flying, high energy performance that literally shook the floor beneath our feet. The upbeat set made us want to move, dance, and sway with the crowd. Powerful emotions pack the songs: the longing, the hope, the confusion. Put plainly, they’re just really good. Vocalist Jonathan Capeci, guitarist Joey Beretta, bassist Anthony Genca, and drummer Drew Scheuer settled into a groove with the floodgates open and the sound pouring into the room, covering everything and everyone. Too often, intensity and energy mean sacrificing quality in the songs, but for Dinner and a Suit no such loss transpires. Each song in their set revealed a truly respectable amount of dexterity in their performance. The performance was just so great overall, but every show does have its moments of sublime beauty. The fourth song in their set, “Where We Started,” deals heavily with hope and forgiveness, combining the beauty of a Coldplay-esque piano ballad with jazzy drum flairs, interjected by moments of heavy beats and rumbling guitars. The combination doesn’t feel forced in any sense, and the emotion in Jonathan Capeci’s voice shines through. The song began with the high-ringing sounds of Joey’s guitar as Jonathan came in on the piano. Soon enough, the crash of the drums and thump of the bass made tables and chairs vibrate across the floor as Jonathan bounced up and down, his hands crashing on the keys of his piano while he wailed into the microphone. It’s really not often that you see any artist rock out as much as Jonathan does on a piano, and again, the skill with which they all come together on the song is just incredible. Flawless isn’t a safe word to use for anyone, but these guys certainly come close. Dinner and a Suit are currently on tour, so if they come through your neck of the woods, drop in and give them a listen, or check them out online at Facebook.com/dinnerandasuit.